Photo by CreatAR Images (AI Qing). Part of the seventh Shenzhen-Hong Kong Bi-City Biennale of Urbanism/Architecture that opened in December of last year, His House and Her House, is a conceptual installation by Shanghai-based architectural practice Wutopia Lab that has transformed two small buildings in an urban slum of Shenzhen into a conversation about the contrasting roles of men and women in the kitchen and how this is reflected in dietary habits. 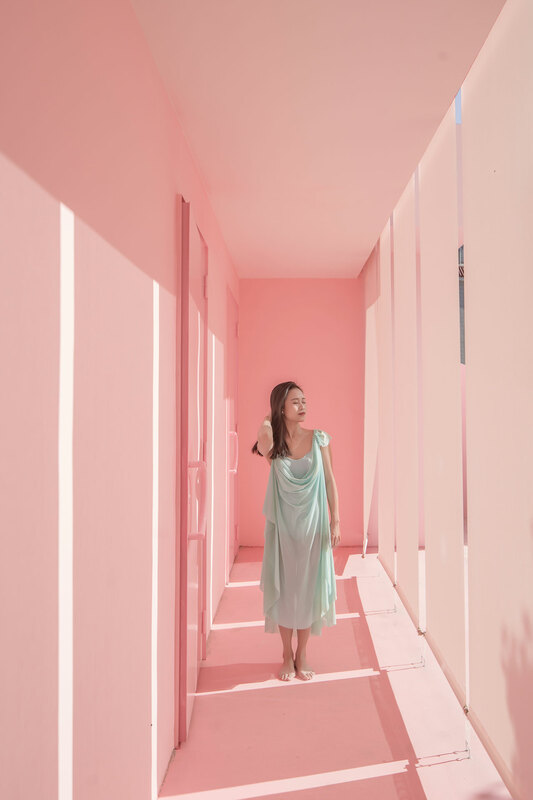 Using blue as an allusion to the masculine traits of perseverance and crudeness, and pink for the feminine virtues of sensitivity and refinement, the project is also a playful metaphor for the complimentary forces that power urban rejuvenation. 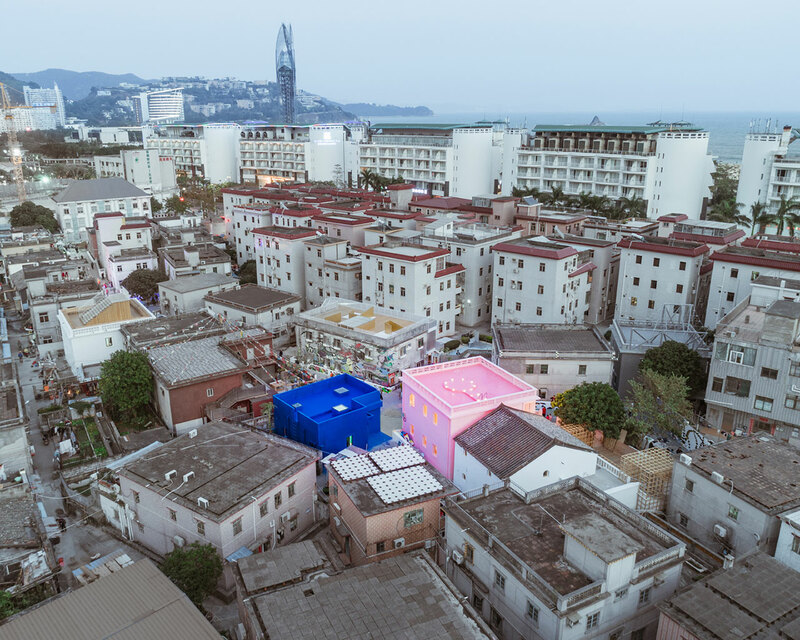 For this Biennale, a decision was taken to integrate all the exhibits into urban villages—squalid urban neighbourhoods, growing independently from the city and providing low-cost living for migrant labourers and new arrivals. 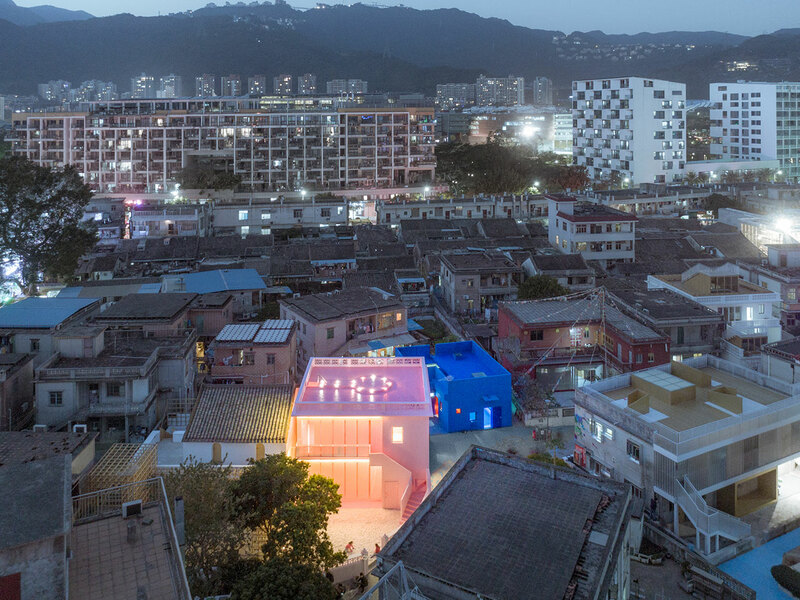 At Dameisha Village, five design studios, including Wutopia Lab, were invited to re-interpret the concept of the village kitchen as a place of urban symbiosis through the renovation of ten buildings. Wutopi Lab’s approach is focused on the roles that men and women are culturally assigned to in the kitchen: men usually being associated with public cooking and women with domestic, and the different dietary and eating habits that this distinction entails. 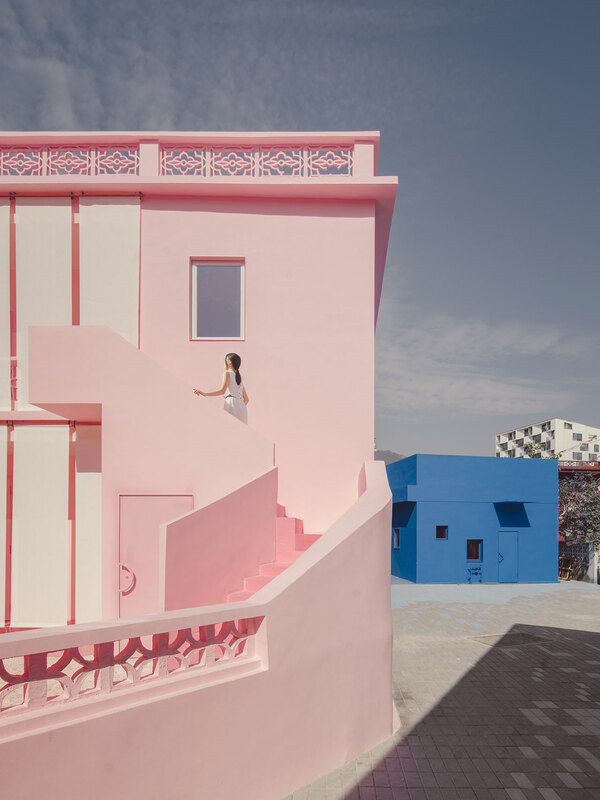 Visually and conceptually, this is accomplished by colour-coding the two buildings that comprise the installation as a way of assigning them a gender: light pink for the female building and blue for the male. Although these two colours are stereotypical of the two genders, they are also symbolic of other relevant attributes, blue for survival and competition and pink for sensitivity and delicacy, but they also allude to the invisible forces that hold the urban fabric together—both blue and pink are typical colours of insulation materials. 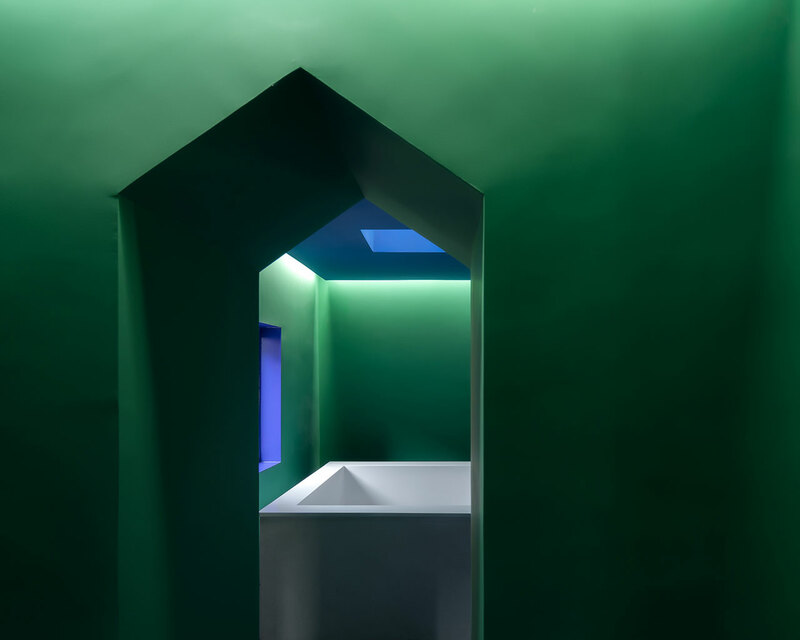 The one-storey, blue building, referred to as “His house”, accommodates three exhibition rooms featuring green walls and blue floors and ceilings, an allusion to Matisse’s palette, each representing a testosterone-laden culinary facet: liquor, cured meat and barbeque. Apart from their unrefined, street-food sensibility, what ties these themes together is that each relates to an age-old method of food preservation—fermentation, curing and smoking—which reflects the human desire of self-preservation. 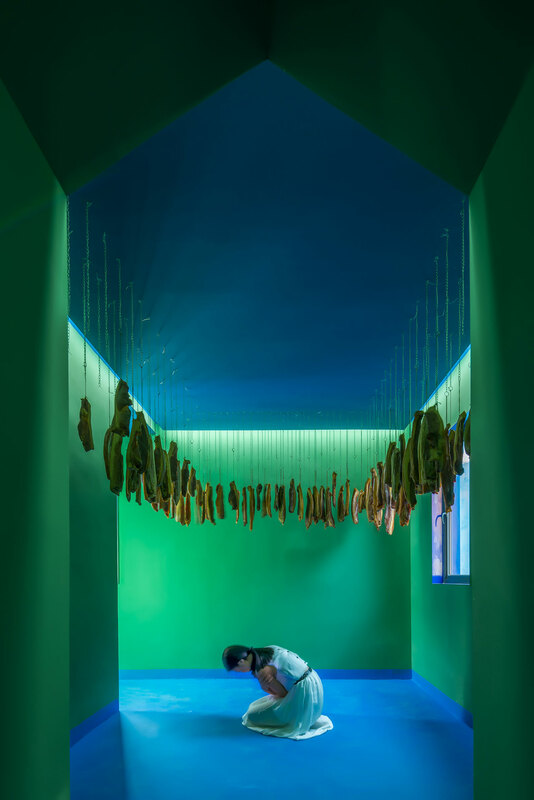 The larger of the rooms features a pool of beer and a wall made out of wine bottles, while in the next room bacon chunks hang from the ceiling in meticulous alignment, graphically summing up the architect’s underlying theme of a "Wine Pool Meat Forest". A fourth, “meditation” room, a refreshingly white space flooded in daylight though a skylight above, whose floor is covered in salt, a key ingredient for food preservation, has a purity that is both de-toxifying and cleansing. 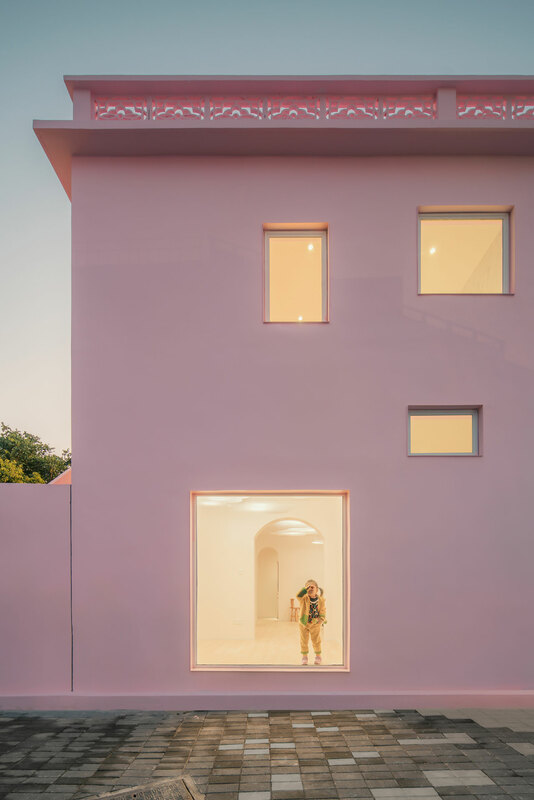 Whereas the interiors of “His house” are peppered by a triangular motif found in the door frames and handles that emphasizes its masculine character, “Her house”, a two-storey building of light pink features instead a semicircular motif that speaks of its femininity. 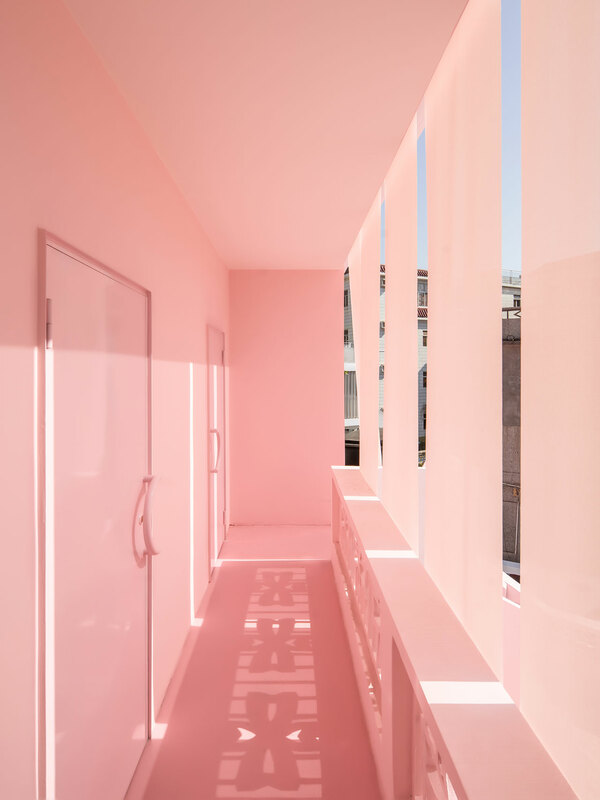 The pink, minimalist interiors are a labyrinthine series of interconnected rooms spanning two floors and covering themes indicative of a refined diet and a prudent way of life such as tea, incense, the art of flower arrangement and vegetarian cuisine, while the roof top, which is reached by a vertical ladder, is conceived as a special space of contemplation. 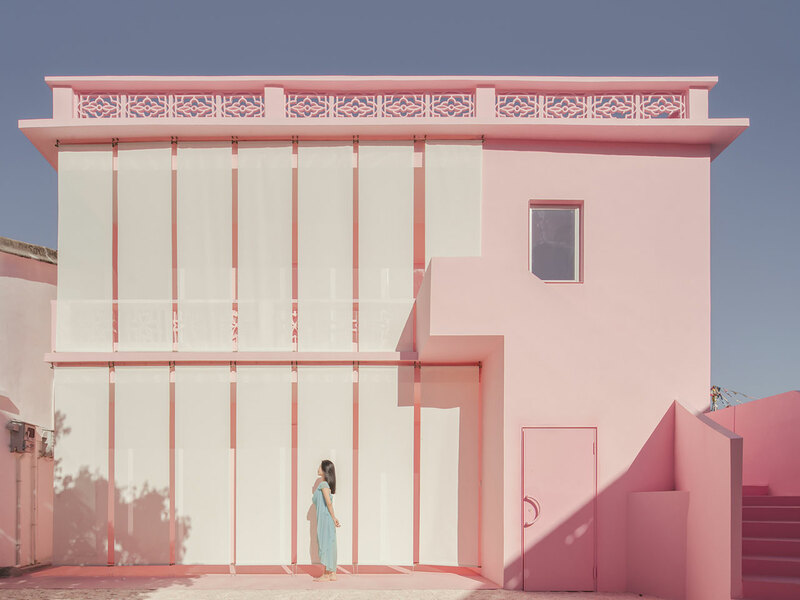 On the front of the building, vertical bands of veil-like fabric cover the balconies as a sign of female introspection while a yard of pink rock salt colourfully defines the boundaries of the property. 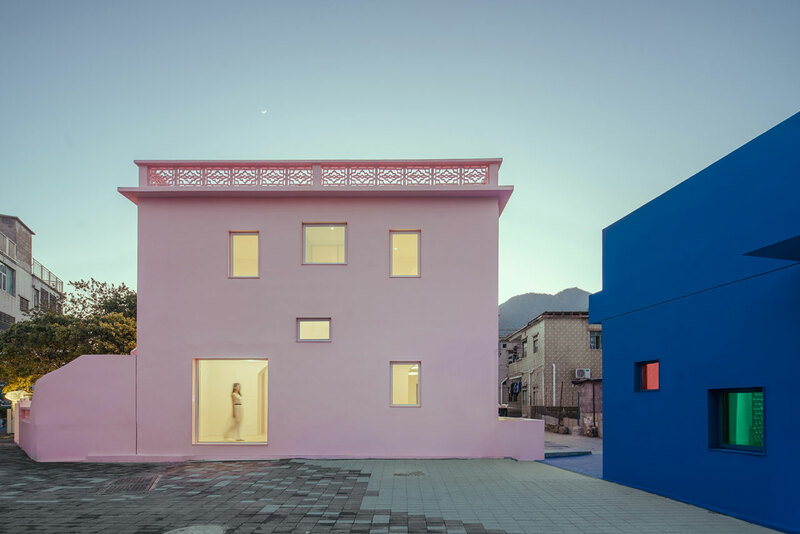 In both buildings, the irregular composition and size of windows, which reflects the haphazard way they were built and their tenant’s divergent needs, have been preserved as glazed openings that allow glimpses into the interiors while cheekily complementing the playfulness of the blue and pink cubic volumes. Set against the grimness of the surrounding slum, the exuberance of these two colours stands, above all else, for the enduring human desire to survive and flourish that throbs underneath the urban squalor.